How do I give someone a DVcreators downloadable product as a gift? We were the training company Apple chose to help launch Final Cut Pro with training on disc, in workshops in over 60 cities and all major trade shows. We have taught alongside Randy Ubillos, the creator of Final Cut Pro (and talked him into adding some cool features to the application!). We’ve helped hundreds of thousands of FCP editors further their Final Cut Pro knowledge. Most of the people currently writing books and teaching Final Cut Pro are our former students! Final Cut Pro Foundations is the quintessential Final Cut Pro editing course, guiding users through every step of the essential editing process from organizing projects through capture, basic editing and fine-tuning to exporting the final project for delivery in the highest possible quality. Complete with student project files, Final Cut Pro Foundations is the only chunkalized Final Cut Pro training in the world! During the course, you’ll edit together “Mr. Right”, a short comedic tale of revenge and intrigue that steps users through editing a real world project incorporating many editing techniques and challenges that may arise in any project. • finding audio peaks and an awesome secret for getting location sound without distortion• how to export Quicktime movies with pristine quality for DVD or the web- the quality difference will knock your socks off! We believe that in order to master any software, you must do, not just watch. Final Cut Pro Foundations is taught in our unique, innovative chunkalized™ learning environment, where you will actually build the tutorial project yourself in Final Cut Pro, with the help of your virtual instructor. Each technique and process is presented as a series of clear, easy-to-understand steps. Instead of covering tools and concepts in an artificial order dictated by the software, the knowledge in Final Cut Pro Foundations is presented in the context of completing a real world project. So, when working on your own projects, you’ll immediately be able to put what you’ve learned to work. In our chunkalized™ learning environment, you must verify that you comprehend and have completed each step in the process before your virtual instructor moves on. You learn at your own pace. Quickly move through sections you understand, have your virtual instructor repeat steps or sections, take “lab time” and experiment whenever you wish because you are the only student in this class. You have total control. If the course goes too slowly, you can play several chunks before switching into Final Cut Pro. No one should learn alone. We have included an ”Ask a Question” button that posts your question on our forums for thousands of other Final Cut Pro users to answer. You are always welcome to join us to ask questions, offer advice, and share tips with other students and your instructor. Should I buy Final Cut Pro Foundations if I’ve been editing in Final Cut Pro for years? The course is mostly designed for new users, with material that will be familiar to anyone who has editing with Final Cut Pro for a while. However, any editor who has not yet attained the mastery of Final Cut Pro they desire will find going through the whole course from the beginning solidifies and improves their understanding of Final Cut Pro and the editing process in general. And, there are some sections, for example, on exporting, or media mangement, that could be worth the price of this course all by themselves even for very experienced editors. For example, if you only learned how to make your exported files look 1000% better than they do now, is that worth $9.95? Click here to ask a question about this course or Final Cut Pro. I jusst bought FCP5. This will be my first attempt at any editing ever. Will this DVD be of help in getting me started with editing since i am really a brand new ‘newbie’ at this ??? thank yhou for a reply . It will be the perfect thing! What other Final Cut DVDs do you have in the pipeline? Overall, I think Final Cut Pro Foundations is an excellent DVD for beginners. Any school using Final Cut Pro as its edit system should purchase a copy to get students up to speed quickly. And anyone who is thinking of purchasing, or has recently migrated to, Final Cut Pro will find the information immensely valuable. For $59.95 you get everything you need for about the same price as a big heavy text book. I give Final Cut Pro Foundations a Strong Buy Recommendation. Now you’re exactly where you should be when your double click our project. I strongly recommend this tutorial to all FCP users, even the experimented ones since there’s always something new to learn as it’s the case with all Dvcreators tutorials. I can’t wait to see Josh and his team launching more interesting products like this one. Could I please ask what is the cheapest shipping price to send this to The Netherlands?? Just wanted to say that I got your FCP Foundations dvd, and it is wonderful. An excellent learning tool. Looking forward to an advanced tutorial. My husband loved this DVD and has already learned a great deal more than he would have with trial and error. He is not a beginner, but he thought the overview on the things he did know was still helpful. He especially loved the tricks and tips provided. Thanks for making a great in-depth tutorial! Follow along and do each step with the samples they provide to get the most out of it. I bought your FCP powerstart for FCP 3 long time agoa while I still was in college. That’s the best investment I ever did in my whole life. I am simply in love with your work. Since Foundations is a DVD, can we play it on a standard DVD player? My G4 is kinda old. I just wanna ask if we can have a downloadable version of most of the tutorials. I am living far and would want a copy right away. Thanks. I do not have the software FCP, or any experience with this program what so ever. I have a MacBook Pro 10.4.11. Will downloading this file work for me AND my computer. Once again, I have never seen FCP before. 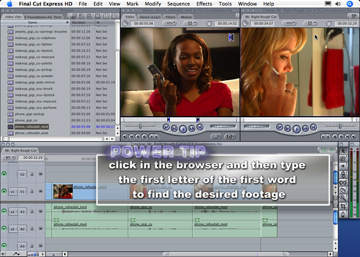 It will help you a lot to learn how to edit with FCP. Once you do actually have FCP, you can go through the course again in hands-on mode which will enhance your editing ability immensely. does it cover FCP studio (FCP6+) ? All the information in our Final Cut Pro Foundations course applies to Final Cut Pro 6.
can you do this course with Final Cut Express HD? If you are using Final Cut Express, I would recommend our Final Cut Express Foundations course. How long is the FCP Foundations course? Thanks, I am looking forward to it! What is the difference between Final Cut Pro Foundations and Final Cut Express Foundations? I saw the excerpts and 2 of them are excactly the same. is it just that the pro version is $10 more? The projects are the same, but since Pro and Express are a little different there are differences in the courses so they apply 100%. I know everyone’s learning pace will vary, but, just approximately, how much time should I set aside to complete this course? Two days? Five days? Two weeks? Thanks for any advice/information you can provide. A day, with a followup day to review and perhaps go through again and experiment should be plenty. I noticed in a previous entry that your course applies to Final Cut Pro 6.0. Does the information and lessons in your Final Cut Pro Foundations course applies to Final Cut Pro 7.0? FCP 7 appropriate ? comments on the DVD go back to 2007… which parts, if any, might ought’a be (Florida) refreshed to reflect current Apple product?